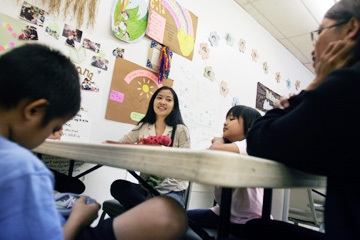 Whitney Shiroma, center, talks with her mother, Romie, in one of the activities rooms at the YMCA's Communities in Schools of Hawaii's office in Waipahu. Younger brother Micah plays with his portable video game player, while sister Skyler quietly listens. The last person Romie Shiroma and her three children expected to see the day before Thanksgiving at her in-laws' parents' home was her ex-husband. "We were under the impression he was on the Big Island," she says. "Before that, we had no contact with him for four years." Because of prior domestic violence incidents, Shiroma once had a TRO, a temporary restraining order, against him. "My great grandma invited him in," said 17-year-old daughter Whitney, a senior at Waipahu High School. "He's got long hair and a beard now. "I waited for mom's OK to talk to him, and," taking a calming breath, she said, "I told myself I felt I can take this." Whitney's younger sibling Skyler continues to sit quietly during her mom and sister's conversation, but the restless Micah chimes in after her big sister. "Is she talking about the dad?" Shiroma, her teenage daughter, Skyler, 9, and Micah, 7, are sitting, one early weekday evening, around a white plastic table in one of the activities rooms adjacent to the office of the YMCA's Communities in Schools of Hawai'i (CIS), located in Waipahu's Westridge Center. Shiroma, who started as a participant, then volunteer at the social work project, is now on staff as a clerk and program aide to what she affectionately calls her office "aunties." She's also a full-time student at Leeward Community College, working toward a business administration degree. Whitney says she's had to pull her own load in watching over her sister and brother because her mom's so busy. "In fact, I'm writing an essay, a life-change statement, for college." She expects to follow her mother to LCC, then transfer later to the University of Hawaii. The teen also works in the A-Plus afterschool program at the Y, because "I didn't want my mom to have all the financial burden during my senior year. "I want to help her 'cause she deserves to be helped," she says. Shiroma, born in the Philippines and raised in Waialua, the youngest, with her twin brother, of nine children, was married for 15 years. But at Christmas 2001, after years of occasional domestic abuse and, later, more blatant ice use by her then-husband, she decided enough was enough. She left with her children to go to a Leeward shelter and, after three months, went to the Onimalu transitional shelter. Along the way, Shiroma names a several social services organizations, like the Child & Family Services and PACT (Parents and Children Together), that offered help. But, even with all the outreach, she says there was still something missing, and that last piece of the puzzle came in the form of CIS. 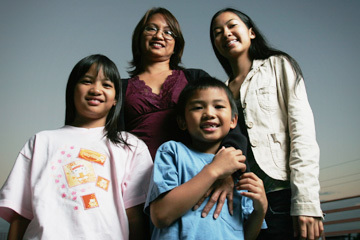 Clockwise from top left: Romie Shiroma and her children, Whitney, 17, Micah, 7, and Skyler, 9, have kept their family bonds strong, in spite of Shiroma's ex-husband's sometime abusive behavior and drug use. The YMCA project helps those like Shiroma by creating interdependent and collaborative relationships with other families-at-risk, although children play groups, infant/parent and literacy workshops, homework assistance, a cultural and performing arts program, youth and adult leadership development, outreach and crisis services, and an ohana management system training program. Shiroma and her children now live in the Waipahu 2 housing project across the street from the YMCA office. "While the other programs helped with my feelings of self-sufficiency, this is what grounded me, how to be part of the community and give back. ... Now I'm in a position to do that, help families in similar positions. "I'm not your typical welfare recipient," adds Shiroma. "My husband and I made good money, we had our own home in Kapolei." Her ex was working as a branch manager of a financial service company and a mortgage loan officer; she was a receptionist for a doctor's an- swering service. "It's just that we got overextended economically, and the problems really started in 1996, when Whitney was in private pre-school." It came to a head when her ex-husband started doing ice at home, and trying to lure his wife to do the same. Still, she said, "It was a hard decision to make, the husband or the kids." Whitney said the family went through "a tough year, from Christmas 2001 to 2002." AT THE surprise meeting at the grandparents' home, Shiroma asked her ex-husband to join the CIS program. "But he's not ready because of his attitude. He's not ready for change. He said 'there's more to life than the program.' "
"He doesn't know he's hurting us in the process," Whitney said. "Not really," replies her mother. "He says these kinds of things to cover up his emotions." "I asked him, if God came, would he be proud of himself or hide, and he said he has nothing to feel guilty about." Shiroma says she's surprised by the way their unexpected encounter played out. "A year before, I would've grabbed the kids and dashed out the door. I guess compassion for him kicked in." "We didn't want to leave," adds Whitney, "and he has every right to be there," considering, while growing up, he spent his childhood being bounced between living with his grandparents and an aunt. Shiroma said, "He told me he just got out of prison -- or the state hospital, he didn't say which was first." She believes he's now residing at the Institute for Human Services. She remains hopeful that the man will turn his life around. "He's basically in the same situation as I was, and I've been able to turn my life around. This is not meant to put down my husband. He could do it and work with this program. ... He did have a rough childhood, with no stable foundation." WHILE SHIROMA acknowledges her family's support, "especially through the earlier, hard part -- one of my sisters in particular was always there for me -- it's actually my husband's mom who's been the most supportive. "And I've had to rely on Whitney for her help. ... We've had to pull together." "It wasn't easy at first," Whitney said. "She went through her rebellion age," said Shiroma. "I had to put my foot down. I told her, 'You're not hurting me, you're hurting yourself.' We had to do a lot with her counselor at school." "I was angry," replies Whitney. "First of all, it was all a misunderstanding. I didn't know mom's side of the story. I would come home whenever, with no solid curfew, and then when we transferred to the shelter, I had to be home before 5 (p.m.) I felt like I was in jail. "It took me a while. I was not comfortable communicating with my mom over what happened to us. But then I realized I needed to act as an older sister. She needed me. I cannot be immature. "It's just common sense, to know that my parents aren't perfect. But now I know it in my heart, too."